Rugby World Cup winner Will Greenwood accompanied the Webb Ellis Cup on its visit to Birmingham to mark ‘One Year to Go’ before two matches in the 2015 Rugby World Cup are played at Villa Park. 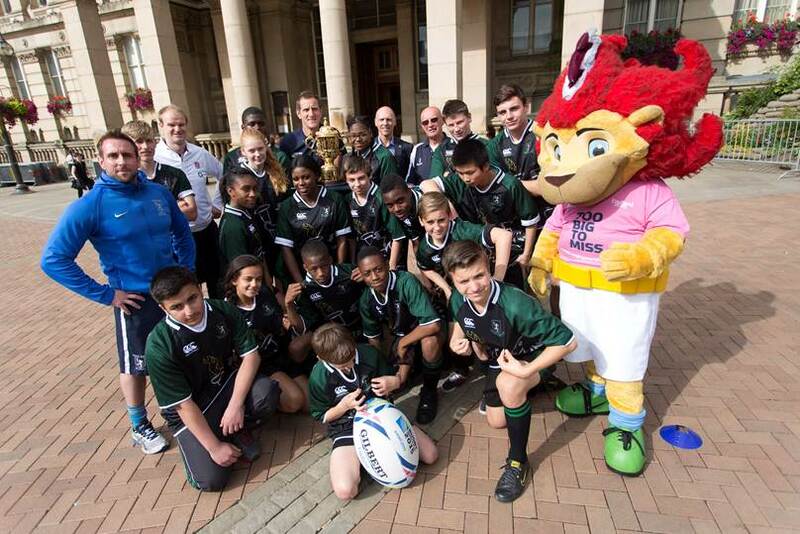 Greenwood, a Rugby World Cup 2015 ambassador, visited New Street railway station with the trophy and then moved on to Victoria Square in front of Birmingham’s Council House where he helped to coach youngsters from the city’s Great Barr School. Great Barr School is one of the schools involved in the RFU All Schools initiative which aims to increase the number of youngsters playing rugby union. The initiative is supported by Birmingham City Council and Birmingham Rugby Partnership as part of the Birmingham Rugby World Cup 2015 legacy. Councillor Penny Holbrook, Cabinet Member for Skills, Learning and Culture at Birmingham City Council, said: “Hosting two of the Rugby World Cup 2015 games at Villa Park is hugely important for the city and the excellent work being done here to promote rugby union among our schools. Villa Park will host the Pool B game between South Africa and Samoa on September 26, 2015, while Australia will take on the Pool A play-off winner at the ground the following day. Teams will use Sutton Coldfield Rugby Club and the University of Birmingham as their training bases while they are in the city.